3 Day Military Diet Plan: Lose 10 Pounds in 3 Days - Diet Happier! Regardless of how its name came to be, ​the 3 Day Military Diet stands out as one of the few proven ways to lose weight in a short amount of time. You also must avoid certain ingredients so as not to compromise your success. After you have dieted the three required days, you can go back to your normal eating habits. When you are on t​he 3 Day Military Diet, you should feel relatively satisfied and see improvements in your weight almost immediately. Unlike other diets, you only have to adhere to this one a few days a week rather than for days on end. In fact, it calls for you to abstain from the way you normally eat for three days a week. The 3 Day Military Diet plan calls for you to diet for three days in a row and then resume your normal eating for the next four days​. Indeed, th​e Military Diet offers you a carefully constructed menu with each meal being well planned out for the entire three days. You must eat the precise foods listed, although some substitutions are allowed, if you want to lose up to 10 pounds ​in 3 days or so. People who want to lose weight for a wedding, swimsuit season, or even to go through surgery may find success when they go on this diet. What Is The 3 Day Military Diet Plan? You do not have to stay on the ​Military Diet for countless days and weeks until you shed pounds. Rather, you follow it for three days a week and then go back to your normal diet. You continue this process until you are at the weight you desire. Instead, the menu includes simple selections like a half of grapefruit or two tablespoons of peanut butter. You eat the food in its natural form without having to mix it together, blend it, bake it, or otherwise spend a lot of time preparing it. Ironically, proponents of the 3 Day Military Diet report that this 3 Day Diet is more affordable than a person’s regular eating habits. You can lose weight without having to break your budget as you might if you tried other weight loss processes. What To Eat On The 3 Day Military Diet? It is important that you follow th​e 3 Day Diet precisely, only substituting food that is approved for this menu. It is also vital that you avoid extra ingredients like condiments, sugar, and excessive caffeine. The first day, you eat slightly more than on the second and third days. It also may seem like you eat more fruits or vegetables some days than others. These combinations may seem illogical at first; however, they are intended to ease your body into the diet process each week while helping you stave off cravings. After you diet those three days, you can then go back to eating meals like normal. If you do not drink coffee, you can substitute the cup of coffee required on the first day with a cup of green tea. You should avoid using any kind of sweetener, such as sugar and honey, in your drinks. The only approved substitute for the diet is Stevia, which is a sugar substitute that is safe for diabetics to use. Why Does The 3 Day Military Diet Work? Favorites like fast food burgers, ice cream, chips, and other popular food items today are so loaded in excess calories that it is little wonder that people are gaining weight faster than ever. On th​e 3 Day Military Diet, you can drink unsweetened tea and black coffee, in addition to as much water as you want. The water helps flush out calories and fat from your body. Even more, because you are not drinking soda, sweet tea, and juice you also are going to shed weight during the three days you are on t​he Military Diet. Still, advocates of this diet argue that it could teach you how to eat healthier and include menu selections like cottage cheese and fruit to your normal diet as well. They also argue that th​e 3 Day Diet can help you overcome addictions to caffeine, sugar, and other foods that are good for you. What Does The Military Diet Do? As you consider t​he 3 Day Military Diet plan, you may quickly come to realize that it differs greatly from other weight loss fads on the market today. Rather, this​ 3 Day Diet plan is structured as a legitimate dietary alteration like those recommended by professional nutritionists to their clients. The dietary changes in this diet allow you to lose weight quickly, yet in a safe and healthy manner. Th​e 3 Day Military Diet plan is safe because it does not deprive you of calories or nutrients you need to stay healthy during the three days you are dieting each week. However, the Military ​Diet requires that you eat three meals a day and stay well-nourished during the time that you are reducing your caloric intake. Along with losing weight, you may notice that you feel better and have more energy because of the additional nutrients. Why Is It Called The 3 Day Military Diet? They must follow the order of the diet, much as they would follow the orders of a drill sergeant in the Army, while they are trying to lose weight with this plan. The ​3 Day Military Diet menu does in fact contain a healthy amount of fresh fruits and vegetables and no processed food, other than cheddar cheese. In that regard, it does resemble the spartan meals of the military. When you go on this diet, it can take on the feeling that you are enrolling in a dietary boot camp. Who Created The 3 Day Military Diet? No one has come forward to attach his or her name or that of one’s family to it. In fact, military experts say that this ​3 Day Diet is not one that is followed in any one of the armed services. These changes were then passed around among friends and acquaintances until it landed into public awareness. Doctors are also aware of th​e 3 Day Military Diet and only occasionally recommend it to patients. Th​e 3 Day Military Diet plan, with its high amount of protein, could cause people to develop stones. However, adults in good health who want to lose weight may find the level of success they desire when they use this ​Military ​Diet. It is affordable and relatively easy to follow. They fear that they will have to learn a new method of preparing food in order to lose weight. Rather, you may find that you have everything you need to go on this diet successfully. The ​3 Day Military Diet plan proves to be simple to prepare and follow. Within a few days, your palate should adjust to eating plain foods and drinking unsweetened beverages. They also take away extra calories that have caused you to gain weight in the past​. The 3 Day Diet menu does require that you avoid consuming condiments like mayonnaise or ketchup. It also requires that you avoid drinking caffeine or sweeteners, except for those like Stevia. You may already have most of the food items on hand in your refrigerator or pantry. As you prepare to go on th​e ​Military Diet, it may help you to have a list of what you need to have on hand before you start the first day. To start, you need to make sure you have the right beverages on hand. While you can drink as much water as you want, you cannot drink beverages like soda, juice, or sweetened drinks. Instead, the list calls for you to have regular coffee or tea on hand. The 3 Day Military Diet requires that you eat grapefruit, bananas, apples, green beans, broccoli, and carrots.​If you do not already have these fresh ingredients on hand, you should buy them and store them in your refrigerator. This produce does not cost a lot and can be very affordable even if they are not in season. They also are readily available at any grocery store and very low in cost, which is another advantage that comes with this diet. In fact, this 3 Day Diet proves to be more affordable and easier to follow than those advertised on TV and the Internet. What Can You Drink On The Military Diet? Fruit juice, soda, and even milk contain calories, sugar, and fat that could undermine your weight loss efforts. If you want to drink, you should wait until you reach the four days of dieting downtime. During the three days you are on the ​Military Diet, you should follow the menu exactly, drinking the coffee or tea on the first day and then drinking as much water as you wish. First, it makes you feel fuller so that you do not want to snack or cheat on your weight loss plan. Proper hydration allows your body’s digestive system to work correctly and flush out the fat and calories your body does not need for good health or energy. Can You Drink On The Military Diet? The 3 Day Military Diet is carefully regimented and requires that you follow the menu precisely, particularly if you want to reach the maximum weight loss goal of 10 pounds ​in 3 days. If you drink, you could add calories that could compromise your success. The ​Military Diet menu actually calls for you to drink two cups of coffee or tea on Day One of the diet. In addition to these cups of coffee or tea, you can drink as much water as desired. Anything else like soda, sweetened tea, fruit juice, and even beer or wine can cause to gain weight instead of losing it. However, sometimes it is necessary for people to substitute foods on the menu. The reasons for the substitutions could range from your being allergic to a certain menu item to a food not agreeing with medication you are taking. Fortunately, th​e 3 Day Military Diet comes with a list of agreeable substitutions that can be used to help you lose pounds. These substitutions are valid for all three meals, depending on what food they are meant to take the place of those three dieting days. The substitutions do not require that you shop at specialty stores or eat foods that you may find unpalatable. By substituting these foods in place of those on the menu, you can continue your weight loss journey uninterrupted and without spending a lot of money. Fortunately, a number of options are available to you. These options work with the other foods on the menu without adding extra calories to your diet. However, they are also low in calories and structured similarly to ice cream. They are also both sweet in flavor and could help you avoid craving sweet treats like cookies or cake. Further, apple sauce is very affordable. You can buy a big jar of apple sauce for less than two or three dollars in many stores. A little bit of apple sauce also goes a long way in filling your stomach. You cannot go off your medicines without negatively impacting your health. Rather than jeopardize your health or your diet, you can substitute grapefruit with these options. As odd as it may sound, baking soda has similar chemical structure to a grapefruit. You can add two teaspoons of baking soda to about six ounces of water to create a beverage that will react similarly with the other menu items for that meal. Mandarin oranges are different than their standards counterparts in size, taste, and chemical structure. Eating either fresh or canned mandarin oranges can take the place of a half of a grapefruit at breakfast during this diet. Some of the reasons include the fact that tuna has a strong taste and smell, which some people may be unable to tolerate. Other people may be vegan or vegetarians and thus want to eat other proteins in tuna’s place. You can eliminate tuna from your diet’s menu by including these substitutions. If you are a vegetarian or a vegan, you may use tofu in your menu. Tofu provides you with a similar amount of protein and also interacts the same with the other menu items to help you lose weight. Despite ​the 3 Day Military Diet having a very regimented menu, sometimes you need to substitute foods for others. These dietary options are available to you. Can You Chew Gum On The Military Diet? Chewing gum that is not sugar-free and calorie-free adds sugar and calories to your diet. Even the smallest addition of calories can cause you to lose less weight than you desire and force you to stay on the diet for longer than you had planned. Chewing one or two pieces a day during the three days of dieting each week would be okay if you are chewing types that meet this requirement. Many dieters fall off their diets when they feel like they are being deprived and desperately want to indulge in old favorites like cake or candy. Chewing sugar and calorie-free gum that you like and have chewed before can help you stay focused and feel less like you are dieting. It is important to know, however, what items to substitute for the foods you are omitting. You also show know in what amounts these substitutions can be made. It is important that you avoid putting any sweeteners in it like sugar or honey if you want to lose weight effectively. You can continue on with your diet knowing that you are not adding extra calories or fat to the process. Other people who perhaps would do well to wait include those who have kidney or gall bladder conditions​. However, healthy adults who want to lose weight quickly may find the success they want when they embark on this weight loss plan. This 3 ​day ​diet could be ideal for someone who needs to drop weight for a wedding, to fit into a formal outfit, or to go through a medical procedure. What To Eat After The Military Diet? The 3 Day Military Diet follows a carefully planned menu​. If you follow this menu precisely, you should lose up to 10 pounds per week without any problem. However, people who decide to make their own substitutions to the menu often experience failure and actually risk gaining weight instead of losing it. As such, it is essential that you keep the grapefruit in your menu or substitute it with approved selections, such as mandarin oranges or a bicarbonate of soda. You can still lose weight and eat according to the menu by using this substitution list. Why Hot Dogs On The Military Diet? However, hot dogs are included on the military diet menu for a couple of important reasons. Once you understand the reasoning for their placement, you can decide whether or not to keep them or replace them with a suitable alternative. ​Hot dogs are also easy to prepare, another important aspect of this diet. To help you avoid feeling deprived, this menu features foods that are fast and easy to prepare so that you can eat your meals right away. If you are a vegan or vegetarian, you can also substitute with beans and lentils so that you get the required amount of proteins and iron required for this second day dinner. Why No Coffee On the Military Diet? Even so, a black cup of coffee itself only contains five calories. If you truly need a cup of coffee several times a day during the three days of dieting, you can include them and reduce your serving sizes of other foods on the menu. If you would prefer coffee in favor of ice cream, you can keep your coffee and reduce the serving size of your ice cream to a half of a cup. Likewise, you can reduce the serving of cottage cheese to a half cup if you need to drink a few cups of coffee that day. If you are addicted to caffeine and are not ready to break your coffee-drinking habit, you can make these alterations in the menu. You should not, however, add anything to your coffee like sugar, milk, or creamer because of the extra calories these additions bring to your diet. How Many Calories In The Military Diet? As you will find out, the menu contains just enough calories each day to keep you nourished and safe while you lose up to 10 pounds​ in 3 days. The second day’s menu contains slightly fewer calories, with 1200 being the total for that day. The highest caloric foods on that day’s menu are the hot dogs, the ice cream, and the cottage cheese. Despite the lower calorie counts each day, you are still eating foods that contains nutrients like Vitamin C, calcium, iron, and protein. With the calories counted out for you, it is also important that you only use approved substitutions if you need to omit foods from the original menu for this diet. Is The Military Diet Plan Safe? Because th​e 3 Day Diet's restricts caloric intake, these women may do well to wait until they have delivered or have weaned their babies. As such, children and teens are advised to wait until they are older to begin this diet if needed. The foods are nutritious and proven to be safe to consume. Does The 3 Day Military Diet Meal Plan Work? Many people who are unfamiliar with th​e 3 Day Military Diet often wonder if this weight loss plan actually works. The entire process involves changing your diet and eating foods that are carefully grouped together over the course of three days. These combinations allow the nutritional components like the vitamins, minerals, and acids to help you lose weight faster. People who go on the ​3 Day Military ​Diett and lose weight can keep it off by avoiding the behaviors that caused them to gain weight in the first place. These are the people who keep the weight off and show that the Military Diet can work quite well. The results may at first seem varied. However, with closer scrutiny people can discover that th​e 3 Day Diet works quite well for people who follow it precisely and take care with their diets after they finish this plan. Individuals who have done their research and taken the time to understand fully how this diet works will reasonably have better results with their long-term weight loss. It is the people who use th​e 3 Day Military Diet plan for 10 weeks or so and then go off of it, only to return to indulgent eating habits that garner this diet unfavorable results​. Their weight loss accomplishments are those that should be reviewed when considering the results of this diet. Regardless, people looking for a diet plan may take an odd amount of consolation in these before pictures because it shows other dieters have sought out this plan for the same weight loss purpose. Curiously, people make these before pictures widely available on the Internet. They post the pictures on blogs and on social media, among other virtual places. As such, these photos are not very difficult to find. Losing weight can be such an emotional journey for anyone that they need some sort of visual confirmation that the plan they are choosing will work. The before pictures provide the proof they need that this ​3 Day Military Diet can be for everyone, especially those who want to know that this plan can help them shed the weight quickly and effectively. As stated, losing weight can be an emotional journey. People are unsure if they have what it takes to go through a course of several weeks, changing their diets, and finding the willpower not to backslide. They fear that they are not good enough to lose weight or that something is wrong with their bodies that the plan will not work. Many people can envision themselves thinner; however, when they look in the mirror their visions are met by the abrupt reality of their weight gain. By looking at other people’s after pictures, their reality can start to change to match that of the vision they have of themselves at the weight they desire. 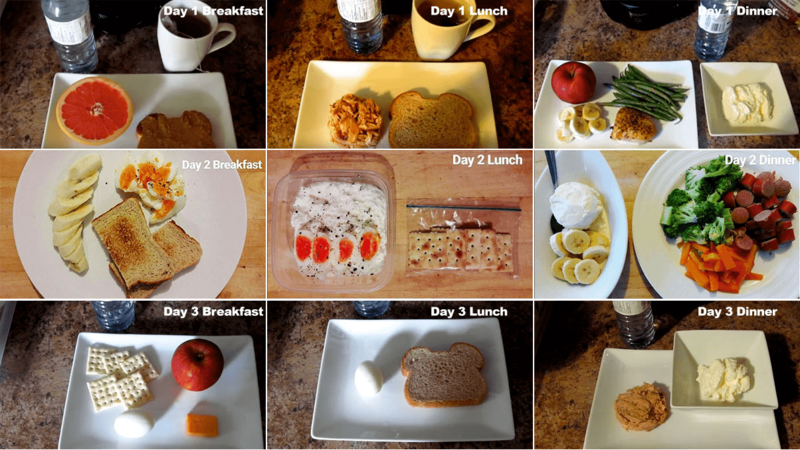 When they cannot find confidence in themselves, they can find confidence in the after pictures of this 3 Day Diet plan. They may also anticipate putting their own before and after pictures on the Internet to prove the ​Military ​Diet results to other hopeful dieters. In fact, the reviews for the 3 ​Day ​Military ​Diet are overwhelmingly positive and can be found on a variety of sites. These reviews show that people are getting the results they want and expect and that they recommend this plan to other weight loss hopefuls. Everything you need to follow this plan can be found either in your kitchen or at your local grocery store. Further, most of the food that goes into this weight loss menu are things you probably eat all the time. You do not have to try out new foods or stomach things that you do not like to eat. When you read these reviews, you may take heart in knowing that this plan can help you lose weight without having to invest a lot of money, try unsavory foods, or invest in equipment and supplements that you will only use for a short time. You can gain confidence that everything you need to start losing weight is already available or easily accessible. Many people believe that doctors are reluctant to promote any dietary product or medicinal process that does not somehow directly benefit them. Yet doctors have gone on record as saying that this diet could very well work if people follow it correctly and make sincere attempts to change their diet after they lose weight. However, doctors urge that postpartum women should time their dieting with care so that they avoid compromising their health and find themselves unable to take care of their babies. Even more, women who are nursing are urged by doctors to avoid this doctor simply because nursing women’s bodies need double the normal amount of calories per day to lactate sufficiently. Restricting her caloric intake could cause a breastfeeding mother to stop producing milk for her baby. Doctors note that this diet ultimately would serve people who are in good health, those who have not recently had a baby or are nursing, and those who have no underlying health conditions that could put their wellness in jeopardy. Also, teenagers and children are cautioned against this diet because they too need extra calories for brain growth, immunity, and other aspects of wellness. Just like any online review for any product or service, you will find disgruntled reviews from people who either failed to understand important aspects of this 3 Day Diet or who for whatever reason failed to accomplish their weight loss goals. Each review you read must be viewed with a certain amount of objectivity and discernment. The reviews may show you that the program is easy to follow and relatively pleasant as it leaves you satisfied and well nourished. However, your own success will be determined by how well you stick to the 3 Day Diet ​plan and what kind of effort you put into changing your diet after you reach your weight loss goal. Th​e 3 Day Military Diet provides you and others with a unique opportunity to lose weight in a timely manner without having to spend a lot of money or exert a lot of extra effort. How Well Does The Military Diet Work? You cannot make substitutions on the menu or diet for shorter or longer periods of time than the prescribed ​3 days per week if you hope to lose up to 10 pounds ​in 3 days. If you follow the menu precisely, you should be able to count yourself among those for whom the diet has worked very well. Instead, they were too presumptuous thinking that they could make menu substitutions, such as tilapia for tuna or almond milk for the vanilla ice cream. Because they adjusted the menu to their liking instead of using the approved substitution list, they undermined their own success at losing weight. Other reviews state the people did not work out when they were on the 3 Day Military Diet. While working out is not necessarily prescribed for the 3 Day Diet, it can benefit dieters who hope to lose the 10 pound maximum ​in 3 days. Even simple exercises like taking a walk around the block once a day can help you reach this 10 pound loss ​in 3 days. Does The Military Diet Work Long Term? It is true that people can quickly lose weight during the time they are on the​ 3 Day Diet. They are often thrilled with the results and are eager to show others how quickly they lost weight. However, many people backslide once they go off the diet because they resume their former eating habits, indulging in foods that are fatty, high in calories, and generally are not good for keeping their weight down. This backsliding can occur with any diet. You cannot go back to eating fatty, high-calorie foods repeatedly each day if you hope to keep the weight off. You must use common sense and indulge in fatty favorites only occasionally. Further, you must keep up some sort of fitness, even if it low-key like walking around the block or doing a few sit-ups each day. This extra physical activity will help you burn calories. Finally, you must consider what beverages you drink each day after you go off the 3 Day Diet. You may have noticed that the ​Military ​Diet’s menu only allowed for water, black coffee, or unsweetened tea. You cannot go back to drinking soda, fruit juices, Vitamin D milk, and other fatty, sugary beverages if you hope to keep the weight off for a long term. Should You Workout On The Military Diet? While the ​Military ​Diet goes a tremendous way in helping you lose up to 10 pounds ​in 3 days, you can speed your weight loss goal along by working out. When you work out, you burn more calories and in turn tone your body. By the time you reach your weight loss goal, the Military Diet and the exercise both will have helped you look and feel better. If you have never before worked out, you may need to ease yourself into a fitness regimen. Simple exercises like walking around the block or lifting small two pounds weights can go a long way in helping you build up resistance. By staying consistent with your exercise, you help your body burn calories faster during the days you are dieting. You also increase your metabolism so that your body only keeps the calories you need to stay healthy and active. Does The Military Diet Work Without Exercise? It can allow you to lose up to 10 pounds ​in 3 Days even if you do not exercise regularly. However, in truth few people reach this 10 pound mark ​in 3 days without at least some form of exercise being added to their daily regimen.​ Only people who have very high metabolisms reach this mark without exercising​. ​If you want to lose weight rapidly and reach that 10 pound goal ​within 3 days, you should include some sort of exercise in your daily routine. You can also do 10 sit-ups each morning until you build up resistance. These simple and relatively painless exercises will help you burn calories and increase your metabolic rate. Warning signs you should watch for while working out include dizziness, chest pains, weakness in your legs and arms, or blacking out before, during, or after exercising. If you experience any, you should cut back on your fitness plan. Can I Do The Military Diet While Breastfeeding? The 3 Day Military Diet restricts your calories for three days a week. While this brief caloric restriction would not affect someone who is healthy and not pregnant or breastfeeding, the menu could adversely affect you if you are providing milk for your baby. The restriction in calories could cause you to stop lactating altogether. However, you may be able to go on the ​Military Diet if you are considered to be significantly overweight by your doctor. If you have more than 40 or 50 pounds to lose, your doctor may approve you going on this diet. During the time you are breastfeeding and on the 3 Day Diet, you should check in with your doctor often. Your doctor can ensure that you are lactating enough and that your baby is receiving enough sustenance. Your doctor can also advise you when you have reached your ideal postpartum weight. Rather than continue with the diet, you should listen to your doctor and take your weight loss clues from a medical professional. How Healthy Is The Military Diet? The ​Military Diet stands apart from these fads in that it has been used for years by everyday people to lose weight. Even more, it is healthy and continues to be a proven way to lose up to 10 pounds per week. You can rest assured that it is safe and only requires that you make small changes to your eating habits three days a week. In fact, most, if not all of the foods on the Military Diet are things that you perhaps already eat regularly. These foods are low in cost and so common that you would know beforehand if you are allergic to anything on the menu and need perhaps to substitute with something else. The foods are not altered in any way to deprive you or compromise your health. How Safe Is The 3 Day Military Diet? It provides you with plenty of protein, iron, calcium, Vitamin D, and other nutrients that you need for good health while also allowing you to eat enough each day of the diet to feel satisfied. However, it should be noted as well that some people perhaps should avoid this 3 Day Diet until they are cleared by their doctor to begin it. This especially can pertain to pregnant and nursing women. They should wait until they have delivered or weaned their infants before starting this diet simply because they need extra calories each day to sustain their babies’ health. People who have kidney or gall bladder issues also should avoid this 3 Day Diet until they are medically cleared. The amount of protein in the diet could cause them to develop stones. The 3 Day Military Diet menu calls for you to eat healthy and safe foods like tuna, eggs, whole wheat bread, and even vanilla ice cream. These foods are proven to be safe and are readily for sale at every grocery store. The other four days allow you to resume your normal eating habits within reason. As long as you are good overall health, those three days each week should not affect your wellness or your weight loss goals.